are highly automated. The company Automationpro has developed a machine that inspects the height of pressed-in contact pins on PCBs (Press Fit Technology) inline immediately after the pressing process. If the pins are not completely pressed through the openings, it is not possible to establish contact with other components, which may cause failure. the scanning position. 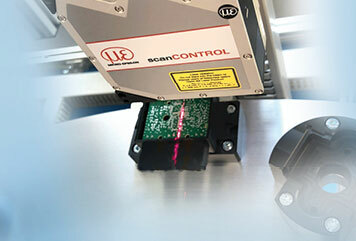 The scanCONTROL is being moved by an actuator connected to an encoder which is being used for triggering the line scanner to ensure regular profile distances. Depending on the cycle time of the process, the component undergoes a complete scan within 7 seconds, generating 1,280 points per profile.